Help us keep rail to Newcastle. Govt plans to cut on Xmas Day! NSW Government announced it will close Newcastle Rail Line. Last train Christmas Day 2014. All Newcastle passengers to be off-loaded to buses at Hamilton or Broadmeadow for at least 2 to 3 years from Boxing Day. No replacement system has been approved nor planned, so the intention seems to be to simply close off train transport to Newcastle. Why would they close Newcastle Rail Line? Mine Subsidence Board approval would not be an issue. It is not restricted by Mine Subsidence Board building height limits. The cost of grouting disused mine shafts is huge and runs into millions of dollars and can be as costly as the proposed building itself. Undermined sites, even when stabilised, cannot support excessively tall buildings. The rail corridor, which is quite wide around Newcastle Station including the bus layover (110 metres), can support an unlimited building height. This is of concern in light of proposals to amend the height restrictions in the LEP and SEPP. A developer’s dream (2008 GPT website) showed 6 bulky high rise buildings over Newcastle Station, incorporating Wharf Road and existing parkland beyond Queen’s Wharf. This proposal occupied approximately 15,000 square metres of what is currently publicly owned property. Forced interchange - inconvenience and delay (up to 30 minutes each way) all passengers to Newcastle from Sydney, Central Coast, Lake Macquarie, the Hunter Lines from Scone Dungog and Maitland. Commuters, TAFE, Uni and school students, inland communities wanting to get to the beach and city will be affected. Educational and work opportunities for youth will be cut. Most disadvantaged - passengers with reduced mobility - disabled, especially blind people, frail aged, those with bicycles, prams, surf boards and bulky luggage. Loss of public transport patronage - estimated 30 % to 60%. Added pollution - more cars and buses. Abolition of Fare-Free Zone - bus service in Hunter Street discontinued. All bus routes to Newcastle Station to terminate at Wickham or Marketown. Stockton Ferry to be isolated. Railway Street crossing to be permanently closed - effects on business & local residents. Loss of customers to businesses in the CBD. Loss of Newcastle Station and other rail features. Development on rail corridor, as announced by Planning Minister - could include tall buildings, with changes to height regulations / new SEPP and LEP. WASTE/MISUSE of PUBLIC FUNDS - many infrastructure needs, but money being allocated to cut off infrastructure. Pay for advertising and hire of event venue. Save Our Rail is a group of unpaid volunteers, who undertake to work on behalf of the community, to retain services and advocate for public transport. <="" can="" you="">Please donate generously to our campaign. You can join in our campaign events listed on our website. 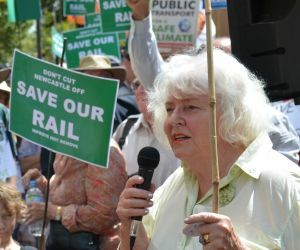 Tell us what you think of the Government's plan to cut the rail line to Newcastle. Stop them cutting us off. Help us keep Newcastle Rail Line. One puff and it's all gone! Get in touch with Help us keep rail to Newcastle. Govt plans to cut on Xmas Day!